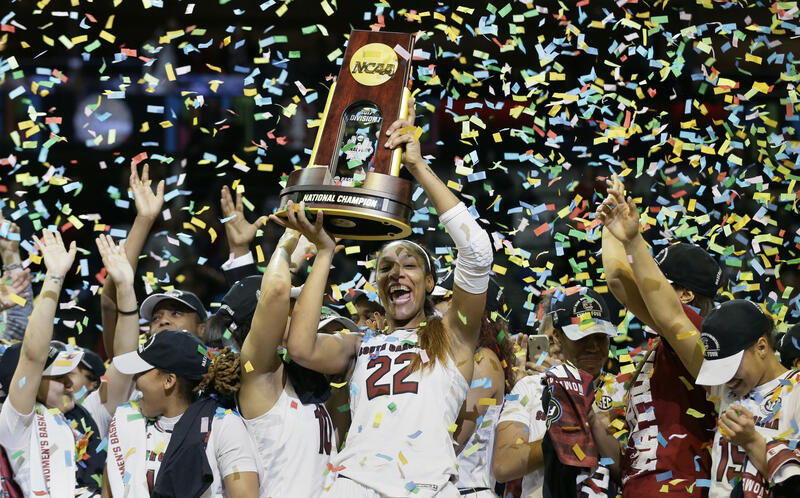 DALLAS -- Dawn Staley finally could raise an NCAA championship trophy. A’ja Wilson scored 23 points to help coach Staley and South Carolina win their first national championship with a 67-55 victory over Mississippi State on Sunday night. Staley made the Final Four three times as a player at Virginia but never won. She also led the Gamecocks to the national semifinals two years ago before losing to Notre Dame. Once the final buzzer sounded, Staley grabbed the trophy and paraded it around the court high over her head. She cut down the final piece of the net, waving it to the huge throng of Gamecocks fans while Wilson and Kaela Davis danced with the South Carolina band playing. Mississippi State had all the momentum on its side after a shocking win over UConn on Friday night that ended the Huskies’ record 111-game winning streak. The Bulldogs couldn’t muster the same effort against the Gamecocks. Morgan William, who had become the face of the tournament with the game-winner against the Huskies after a 41-point performance against Baylor, was held to just 8 points. South Carolina (33-4) turned a 10-point halftime lead into a 45-31 advantage midway through the third quarter before the Bulldogs rallied. Mississippi State (34-5) slowly cut into its deficit, getting with 54-50 on Jazzmun Holmes’ jumper. That brought a huge cheer from the thousands of Mississippi State fans who made the 8-hour trip from Starkville, Mississippi. But that’s as close as the Bulldogs could get. The victory in front of a sellout crowd came one day after the Gamecocks men’s basketball team lost in the Final Four in Phoenix. Wilson, who grew up in South Carolina, blocked a shot on one end of the court and then hit a short jumper in the lane that started a 12-2 run to put the game away. Staley emptied her bench with less than a minute left and Wilson left with tears of joy. The junior center sees a repeat in the future for the Gamecocks, who return most of their core players. “Man, just be with us next year, we’re trying to be in this same spot next year, we’re going to see how it goes,” Wilson said after winning the most outstanding player award for the Final Four. The Gamecocks won the title without star center Alaina Coates, who hurt her ankle in the SEC Tournament. She didn’t even travel with the team to Dallas. It was the third loss for the Bulldogs against the Gamecocks this season. Mississippi State dropped a game in South Carolina in the regular season as well as the SEC Tournament title game. No team had a tougher road to the championship then the second-seeded Bulldogs. They were trying to become the third team in NCAA history to beat three number No. 1 seeds en route to the title. Tennessee did it in 1987 and Louisiana Tech accomplished the same feat a year later. The Bulldogs had already knocked off top-seed Baylor and UConn to get to the championship game.